Harvard Secretly Photographed Classrooms To Monitor Attendance : The Two-Way Some students and faculty are upset about the surveillance, but lots of colleges do this kind of thing all the time. 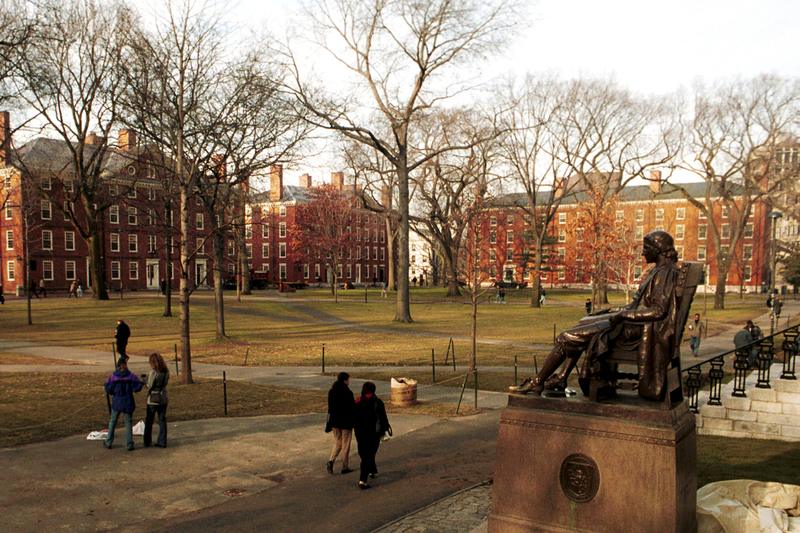 People walk through the University's iconic Harvard Yard. This week, a faculty study that secretly photographed students to monitor their attendance in lectures has come under fire. Some 2,000 Harvard undergraduates, as well as some faculty, were photographed in lecture halls at the school last spring as part of a university study into student attendance. Harmless enough, right? Well, those photographs were taken without those students' knowledge or permission. And that has some people upset. "The protocol was to install a camera that snapped an image of the audience in a lecture hall every minute. The images were processed through a program that counted whether seats were empty or filled. The quantities were calculated for each lecture. Once the data were in hand I made appointments, beginning in August, with course heads (two are still outstanding) to tell them what had been done and to show them generalized numerical data on their respective classes." Bol says the study was approved by the University's Institutional Review Board, and after the data was analyzed, the photos were destroyed. The results of the study are now being shared with other faculty. The Harvard Crimson reports Harvard University President Drew Faust has referred the study to an oversight committee. "Just because technology can be used to answer a question doesn't mean that it should be," Lewis said. "And if you watch people electronically and don't tell them ahead of time, you should tell them afterwards." A University spokesman told NPR that Bol is now working to inform every student who may have been photographed. That spokesman also says that every faculty member involved in the surveillance has already been informed. Harvard Crimson President Sam Weinstock told NPR that the student body's reaction to the news has been muted. "I don't think it's something that's caused major uproar. You see the sort of Facebook post here and there complaining about it," said Weinstock. "My guess would be that not every student would have a huge problem with it. Some people see it as, they're basically studying what's going on in these classes to improve them, without identifying individuals. I wouldn't expect to see people picketing outside the Administration's offices." "Universities that are not Harvard conduct much deeper surveillance on students who take their online and blended courses. Some institutions track how frequently individual students participate in class and how long they spend on readings and on homework problems, along with other metrics that far exceed the capabilities of a camera taking still pictures in a lecture hall. Even traditional universities collect and analyze lots of data on students, including when and where they log into campus networks or enter campus buildings." Harvard was in hot water over surveillance last year as well. In March of 2013, it was revealed that a cheating scandal at the university prompted the administration to search the e-mail accounts of 16 resident deans in the fall of 2012.